Whitehall is located just east of Bexley, and south of Port Columbus International Airport. There are over 20,000 residents living in Whitehall today. In recent years, Whitehall's claim to fame was being the home of a genuine American hero, Marine Sargent Jason Thomas, who was featured on ABCs Extreme Home Makeover in 2006. 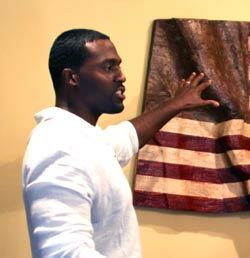 Jason Thomas explaining the importance of the hand carved American flag presented to him by Extreme Home Makeover. Jason is not a person that likes to blow his own horn, but he was responsible for helping locate several Port Authority police officers trapped in the World Trade Center rubble after the attack in 2001. So many things happened after that tragic event, that Jason's actions went mostly un-recognized until the dramatic film, World Trade Center was released. Jason's actions were depicted in the movie, but not the recognition. In fact, Oliver Stone, the director, didn't know it was Jason's actions that helped locate the main characters of his film. When the film was released in August 2006, Jason's heroic actions became known to many people in Central Ohio. In fact, it was some of his co-workers at the Supreme Court of Ohio where Jason worked, that submitted his plight to the producers of Extreme Home Makeover. The film crew faced some of the worst weather possible during the demolition and reconstruction of his home, but in the end, the entire project turned out beautifully. I toured Jason's house this past year and it still looks great and Jason is one of the most sincere guys you would ever want to meet. In 1947 the America's first regional shopping center was built there. The Town and Country Shopping Center had 31 shops including a JCPenney, Kroger, Kresge's, Gray Drugs, and a Richman Brothers. The shopping strip became known as the "Miracle Mile." According to Don Casto, the developer of Town & Country, there were many obstacles to overcome in building such a large shopping strip. Convincing major retailers to venture off the main downtown arteries of metropolitan cities and into an unknown concept in merchandising, the regional shopping center was the most difficult obstacles. Persistent negotiations between the shopping center pioneer Don Casto, Sr. and national retailers James Cash Penney and Sebastian Kresge finally landed commitments for stores in this remote suburban location. Their commitments resolved the daunting task of convincing Columbus Railway Power & Light Co., which controlled public transportation at the time, to extend bus service to the suburban shopping center. Casto also insisted on radical innovations for his retailers that were only reluctantly accepted - like requiring stores to stay open until 9:00 o'clock at night, 6 nights a week and having neon signs that could be seen from the street during all hours of operation. Two of Town & Country's original tenants, Sam's Shoe Service and Swan Cleaners, still operate at the center. Through the years, Town & Country has expanded, been remodeled and repositioned. Concurrent with Town & Country's 50th anniversary in 1999, the center received an exciting new "Main Street USA" look featuring a new facade with brick accents and colorful awnings; redesigned parking lot and traffic pattern; new pedestrian light poles, banners and benches; new tenant identification signs; and extensive landscaping. Today, the 489,617 square foot center continues to provide a vital, convenient shopping alternative in its retail trade market. Just north of Whitehall is the former of home of Curtiss-Wright Aircraft which built the World War II Helldiver aircraft among others. After the war, many of the Curtiss-Wright plants were closed and by 1947 they had closed 16 of their 19 plants. The Columbus/Whitehall facility remained opened by overhauling planes and doing subcontracting work. employing many Whitehall residents. But in 1947, the plant was leased to the Lustron Corporation. When World War II ended, the country had to shift from a war time footing to one of providing homes and jobs for thousands of returning military personnel. Housing units were in short supply. Lustron took advantage of that housing shortage by creating a factory-made, mass- produced metal home that promised to put home ownership within almost every wage earner's grasp. The innovative Lustron Home grabbed national attention and demand. However, a late payment led the federal government to call in the loan it had made to Lustron, forcing it into bankruptcy. It had fallen short of its production goal of 100 houses per day, and had back-orders of 20,000 units. Although some 2,500 houses were produced, about 20% of them have been lost to redevelopment or replacement over the years. More than 300 stand throughout Ohio. The name Whitehall is connected with White Hall, England. In the 1800s, Robert Brotherton of White Hall purchased 156 acres of land between Alum Creek and Big Walnut Creek. On part of his land a tavern was built that he called Ye Olde White Hall Tavern that became a popular stop on the National Road. As the area grew, the small farm community adopted the name Whitehall and the village of Whitehall was incorporated in 1947.